2018 QUIET LION TOUR. Senior Vice Chairman Ian Holding, Secretary Krishna Vanderweide and Tour Leader David Piesse managed the 2018 Tour. Neil MacPherson was the travelling ex POW. Harry Martin travelled privately. Alan MacPherson assisted where required. Ian and David will provide this meeting with reports on the tour. Subsidizing juniors remains an objective. 2019 QUIET LION TOUR. Planning for the 2019 Tour is well under way with the tour team working to ensure another successful tour. Ian Holding will inform this meeting of the details. MEETINGS. Committee meetings have been held as required and Ian Holding has been kind enough to host the meetings at his residence. WEB SITE. Roland Lockhart continues to carry out the technical side of managing the website. We owe him a debt of gratitude. The web site assists in generating and maintaining interest in the BTRMA and we now have regular queries which we answer or refer to a source of information. NEWSLETTER. Elizabeth Brennan collates the newsletter and Ian Holding continues to do a great job in printing and distribution. The newsletter has played a very important part in maintaining interest in the Association and the Tours. The newsletter distribution is becoming increasingly wider. SUCCESSION PLANNING. Our objective to constant rejuvenation and succession planning is proving effective and the long term success of our Association is assured, particularly the popularity of the Quiet Lion Tours. Nominations have been called for membership of the Committee and will be dealt with by this meeting. ACKNOWLEDGEMENTS. To all committee members, office bearers and former POW’s, thank you for your ongoing dedication and support. A thank you for the ongoing support of:- the management and staff at Hollywood Hospital in providing us with these facilities to conduct our meetings and functions, particularly CEO Peter Mott, Director of Clinical Services Karen Gullick and Debra Taylor, Peel Health Campus CEO Doctor Margaret Sturdy and Mandurah RSL for sponsorship of Service Cadets, the Thailand-Burma Railway Centre (TBRC) founder Rod Beattie, Centre general manager Terry Manttan and Researcher Andrew Snow, Roland Lockhart for managing our Web Site and Flight World for flight booking services on tours. Our Association remains committed to the objectives which were enunciated at our very first Annual Meeting and have been at the forefront of our every endeavour since. Our concentration on our objectives and our adherence to their scope has stood us in good stead. We have constantly developed and improved the Quiet Lion Tours to the point where they are recognised by all as historically accurate military tours with the addition of a measure of cultural and tourist experience. The extensive knowledge gathered by our tour team and our Thai guides, plus the presence of ex POWs provides a level of authenticity not generally available. COMMITTEE MEMBERSHIP AND OFFICE BEARERS. The current office bearers have all worked tirelessly for our cause. I continue to review my participation and find it satisfying to look after inquiries generated from the Web Site and carry out the Chairman’s role as required. Again, at Ian Holding’s request, I will continue as Chairman (subject to the agreement of this meeting). Ian remains very busy in his private vocation and in the primary organisation of the Quiet Lion Tour. He is happy to remain as Senior Vice Chairman with Neil MacPherson Vice Chairman, Krishna Vanderweide Secretary/Treasurer, David Piesse Tour Leader/co-tour organiser/Country Liaison, Elizabeth Brennan Newsletter collator, past Chairman Hugh Warden remains a good supporter and provider of wise counsel and it is pleasing to note that Hugh was recently made a member of the Order of Australia (OAM), mainly for his work in the Primary Industry area but also for a number of worthy activities in serving the community (including the BTRMA) and Peter Winstanley as Special Researcher. Allen MacPherson remains on the Committee and is an asset on the Tours. Arthur Anstis has now retired and we are grateful for his help over the years as Treasurer. It is recommended that Arthur be appointed a Life Member of the BTRMA. The formal election of the Committee will take place later in the meeting. I look forward to remaining as Chairman for a further year should that be in the interests of the organisation. Thanks to all Committee members for their contribution to another successful year. It is pleasing that all current members have indicated their willingness to remain in the team for another year. I wish all members and their family’s good health for the coming year and another successful Quiet Lion Tour in 2018 and thank you all for your continued support. Click on the newsletter button for the list of bulletins, with the latest one linked. For service to primary industry, particularly to livestock management, and to the community. Managing Director, Australian Livestock Management Services, since 1995. Consultant, Stud Merino Breeders' Association WA. Inductee, Australian Sheep and Lamb Industry Roll of Honour, LambEx (Annual Lamb Industry Conference), 2010. Royal Agricultural Society WA: Member, Wool and Shearing Committee, 1995-1997, Member, Cattle Committee 199. Former Board Member Meat Program Partnership with Agriculture WA, Councillor 1995-2009. Councillor-in-Charge of History, Strategic Planning, Trade Cattle and Led Cattle. Member since 1973. Livestock Manager 1976-1989. Stock Manager 1973-1976. Burma Thailand Railway Memorial Association: Co-founder 2002. Chair and Vice-Chair. Counsellor, Salvation Army Care Line until 2015. The committee and supporters of the Burma Thailand Railway Memorial Association wish all of you a safe and happy Christmas and New Year. 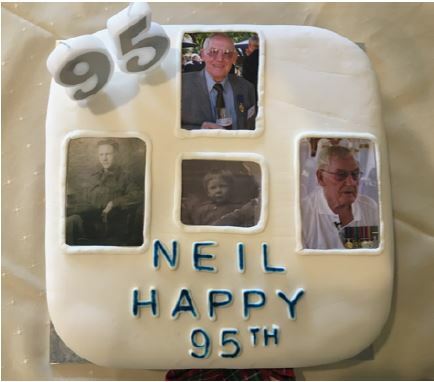 Over 30 family and friends gathered in the RAAF Retirement Village Albany on Saturday 13 May to join Neil in the celebrating his 95th birthday. The guests present included centenarian Harold Martin, Local Member of Parliament Peter Watson and his wife Diane Wolfer, who wrote the books The Lighthouse Girl and The Light Horse Boy. Those people gathered were supplied with the usual Heineken and tasty finger food prepared by the local village residents. Gypsy O’Dea, Neil’s granddaughter, spoke of Neil as a tremendous role model for the whole family and his great strength and endurance. A good time was had by all Neil with Harold Martin and Murray Maxon were also invited to a small afternoon tea at the Federal Member for O’Connor, Rick Wilson’s, office. Murray Maxon, is a 97-year-old veteran Fighter Pilot who flew over France with his brother in the same plane, both awarded The Croix de guerre by France. The Minister for Veterans Affairs Dan Tehan was visiting Albany and they had afternoon tea together. Neil was very chuffed with this afternoon tea. The annual pilgrimage to the River Kwai took place from Monday the 17th of April to the 28th of April 2017 for Perth travelers. (Eastern States travelers returned late on the evening of the 27th of April). Day one was the travelling component. After a 7:00am wake-up call followed by our first buffet breakfast in Thailand and a short briefing of the carers for our students on tour we headed for Bang Pa-in to visit the Royal Summer Palace. This is the site of a timber palacethat was built over four hundred years ago. The palace and its gardens create a magical wonderland of a bygone era in the Kingdom of Thailand and to be able to step back into the history of Thailand. After an hour at Bang Pa-In we traveled further north to Ayutthaya, the ancient capital of Thailand prior to 1767AD when it was abandoned after wars with the invading armies from Burma. This area is now an historic park under the charter of the United Nations. A talk there from Ake (our Thai tour Guide) on the significance of the historic precinct and where it fitted into Thailand’s story. Our next move for the afternoon was on to a pier closer back towards Bangkok where we boarded a ferry for the return trip down the Chayo Phraya River to the River City pier in the centre of Bangkok itself. This is a delightful trip for our travellers to relax and get to know each other after flights the previous day from different parts of Australia. We arrived back at the Royal Benja Hotel around 5:30pm and after a clean-up we had our welcome dinner with all our travelers together as the Quiet Lion Tour 2017. We laid a few ground rules while the group was together and handed out the shirts and caps. Those that needed their beauty sleep moved back to their rooms, Ian and I took a group of students and their carers to Terminal 21, a themed shopping centre which caters for the younger shopper. Six thirty wake up call, bags out, breakfast and on the bus at seven thirty and on our way to Nakom Pathom, the site of Phra Pathom Chedi, the tallest stupa in the world. The significance of Nakom Pathom is that before WWII there was a medical outpost here so the Japanese in their wisdom decided it would be a good place to put a hospital, which they did. It had a capacity of 10,000 beds able to handle all the sick and injured returning from off the Railway and also from Burma. There was a lot of innovative surgery and treatments developed there that save a tremendouslot of lives and relieved a lot of suffering. From here we move to Nong Pladuk, the place where the Railway to Burma left the main railway line that ran to Singapore. This was also known as the 0 kilometre point where all measurements were taken from on Thailand side of Three Pagodas Pass. There was a large prison camp in this area along with workshops, foundries, fuel refineries. Many British POWs were here as Britain had a big dependence on railways and the obvious choice was to collectexperienced railway workers. A few kilometres away is the town of Ban Pong, the railway station where the POWs got off the train from Singapore on their journey north up the railway line to their various places of work. A few of the earlier work forces were lucky enough to have road transport up to Tarsao and beyond. The rest that arrived after the monsoons set in had no choice but to walk as the tracks became impassable and turned into mud. This was extremely difficult as the later forces were also suffering from malaria, dysentery, malnutrition and all the tropical diseases known apart from cholera which was yet to come. We leave the main road and travel to the Mae Klong River east of Kanchanaburi to a camp site known as Tha Maung, this was the main transit camp for POWs travelling up River and for those returning down River. At some stage nearly every POW had contact with this camp, even those returning from Burma. The whole of the camp area is now market gardens for the produce of fresh fruit and vegetables for the Tha Muang and Kanchanaburi city area. This was one of the more pleasant camps to have spent some time in. Food was more plentiful and the pressure of work had eased considerably. Next place to visit was the Bridge on the River Kwai and lunch at Tida Loa's River Kwai Restaurant. After lunch there was a chance to walk over the bridge. The tour is starting to come together very well as we have seen some DVDs on our way out from Bangkok. We took an opportunity to visit TBRC (Rod Beattie’s Thailand Burma Railway Centre) to let them know we were in the area and then to Pung Waan Kanchanaburi Resort for a swim, welcome dinner and Karaoke. The visit to the Chungkai War Cemetery was well received with time for contemplation walking amongst the headstones. From here we went to TBRC to wait for the train to take us over the Wampo Viaduct and back to Tam Krasea for lunch and waiting to watch the train return across the viaduct on return to Bangkok. When lunch was finished it was back on the bus to head up to highway 323 with a monkey stop on the way. We headed to the Pung Waan River Kwai Resort which was the site of the Tarsao hospital camp and a large Japanese Railway headquarters camp. This was the only prisoner of war camp that named their cemeteries, three cemeteries were associated with the Tarsao camp and hospital. Number one, St George's with 206 (19 Australian) graves. Number two, (St Luke's) with 558 graves (120 Australians) and Number three (cholera) with 52 graves (9 Australian). A fourth un-named cemetery had 23 graves. Of the many atrocities which occurred on the Burma Thailand Railway one was at this camp and has been authenticated was the murder of Pte Eric Bernard Hilton of the Sherwood Foresters. From the site of the Tarsao camp and hospital our journey took us to the delightful town of Tarsao itself, situated on Highway 323 with the Sai Yok Noi waterfalls in the towns centre. Tarsao is also the terminus for the part of the Railway still in use with the station called Nam Tok. After a visit to the Seven 11 store and street markets to stock up on snacks and nibbles for our five-day stay at Home Phu Toey. It is nice not to have to put your bags out and race for breakfast and the bus. Today we had the Buddhist Ceremony in the Weary Dunlop Park. This is an event that has taken place for a number of years and is to commemorate and remember the ex-prisoners of war that never returned home from the Railway and particularly to remember those that have passed in the year since our last visit. This year we remembered the members of the Quiet Lion group in Eric Roediger and Milton Fairclough ("Snow") who passed away in October 2016. This was followed by the obelisk ceremony and a memorial to Khun Kanit and Khun Oonjai without whom we would not have had Home Phu Toey. We left HPT for the site of The Hintok Mountain camp, now an arboretum. This camp was the home of Dunlop Force and where Weary Dunlop performed his life saving medical skills with very little in the way of medicines and equipment. Fortunately, he had some very ingenious people in the camp with him that were able to build a water reticulation system that meant the cookhouse had running water and the men returning from work on the Railway could have a shower and get washed and feel a little like human beings again. This water system also allowed for the still to be built that provided distilled water with saline that was used to overcome the cholera epidemic that was rampant during the monsoon. This allowed 60 percent of cholera victims to survive the disease as compared to approximately 90 to 100 percent deaths at the start of the epidemic. It was from here that Jim Allpike carried the saline in glass demijohns to the Hintok River camp twice a day saving countless lives. Next piece of the story is the visit to Sai Yok Yai waterfalls and National Park. A significant place in the Railway history, this is the site of a large camp which included a large contingent of indentured “romusha” which was credited with the construction of a huge embankment nearly two kilometres long to a substantial trestle bridge. This is still visible along with the concrete bridge abutments. There is the preserved remains of a Japanese cookhouse which is worth looking at. Swimming in the waterfall is rather delightful as the streams are spring fed and the water is quite cool unlike the warm bath temperatures of most of the resort swimming pools. After everyone has had a chance to cool off we then boarded a houseboat for a leisurely trip down the Kwai Noi River accompanied by a long tailed boat for control. After an enjoyable lunch on the houseboat and the beautiful river scenery, we come to Hintok River camp. It was from Hintok River camp that the compressor cutting, the compressor embankment, the Hintok Cutting and the Three Tiered Bridge was completed. Owing to the difficulty of building the Compressor embankment and the torrential monsoon rains that kept washing the base away, it was decided to build a trestle detour to the side of the embankment. This became known as the "Pack of Cards" bridge because it kept collapsing. This was the last section of the Railway to be completed to allow trains access to the full length of the Railway from Nong Pladuk to Thanbyuzayat. The last stop for today is the site of the Konyu River camp. This was the first camp that Dunlop Force was to call home on the Thailand Burma Railway. They were very fortunate that it was January 1943 and the weather was fine and dry, this enabled them to arrive here by motor transport. The next job was to erect a camp from attap and bamboo and on completion the group were moved to the Hintok Mountain (or Hintok Road camp) just as the wettest monsoon that Thailand experienced in the twentieth century, with sixteen thousand millimetres of rain recorded, set in. With that in mind we boarded our bus and returned to HPT for dinner and a good night’s sleep in air conditioned accommodation. Slept in until 7:00am, breakfast and a visit to the Hellfire Pass Museum, an institution of the Australian Federal Government, opened in 1998 by the Australian Prime Minister the Rt Hon John Howard. From the museum we headed into Kanchanaburi for the Cadets and Students to have some drill practice for the Wreath Laying Ceremony on ANZAC Day at the War Cemetery. Lunch at the football, Thailand Tigers versus Singapore, burgers and sausages in rolls went down rather well with a cold drink. Thailand overcame Singapore to win a rather hard fought match, the temperature was a mild 42 degrees. On the bus again to return to HPT for dinner and a quiet night. Today we had to leave relatively early to travel Highway 323 to the Kao Laem Dam, an impressive structure built by the Snowy Mountain Authority from Australia under the Colombo Plan to help countries after the Second World War to build new infrastructure. This dam inundates the Railway line from the Takanun camps for a distance of ninety kilometres to the Songkurai camps near to Three Pagodas Pass. Today we have lunch at the EGAT staff Club which is a set menu and one of the nicest Thai meals you could wish to have, our thanks go to the club manager and staff for making us so welcome. Back onto the bus and head back on Highway 323, we pass through the town of Brankassi, site of the Brankassi camp, and a few kilometres further on we pass the site of Hindato camp which has a hot spring on the bank of a small river. This was a favourite place for Japanese engineers and soldiers who had the PoWs build a concrete pool for the use of Japanese staff. Near Hellfire Pass Museum we turn onto the Hintok Road which takes us to the rest station on the Heritage Walk from Hintok Road back to the Hellfire Pass Museum, a distance of approximately 4 kilometres by the time you have climbed up and down steps, clambered over rocks, walked across trestle bridge sites and bomb craters. One and a half to two hours later, if you have had a look at all the works that were carried out by the POWs to complete this section of the Railway, said to be the most difficult on the entire railway. We have made sure we used the plentiful drinking water available. The men working on the rail trace left their camp at 4:00 am with one-pint bottle (600mls) to last until they got back to camp up to eighteen hours later. Arriving back at HPT at 4:30 pm it was time for a visit to the pool to relax, and prepare for our concert. This evening after dinner we held our annual concert based on the 1943 Christmas Concert held at Hintok Mountain Camp called Fun With F.A.. The Railway was completed and the pressure had eased somewhat but there was work parties still required for maintenance work on the track and wood cutting for fuel for the engines. This concert was very well received not only by the prisoners but also by the Japanese and guards. A guest in our midst this evening was a member of the New Zealand Navy, Commander Trevor Lesley, he was very well received by the Quiet Lions and it was nice to have an NZ component of ANZAC to join us. We have a free day today, a chance to visit the Weary Dunlop Park incorporating the Weary Dunlop Pavilions and the Jack Chalker Gallery, both very worthwhile exhibits. There is also a display of a working prison camp hospital with an improvised orthopaedic bed with traction pulleys and a mechanism for raising and lowering sections of the bed independently. Various other exhibits were a dentist’s chair, an exercise bike along with pieces of equipment used for physiotherapy to recuperate injured limbs and bodies. These were made from bamboo. There is also a working model of the still that was built at the Hintok Mountain camp along with other paraphernalia,intravenous drips made from sake bottles and stethoscope tubing and treatments for tropical ulcers. After the morning spent at Weary Dunlop Park, it was time for lunch and an afternoon at leisure taking in the delights of HPT and repacking bags for a very early morning departure to get to the Dawn Service at Hellfire Pass. A small group travelled to Three Pagoda Pass to follow in the footsteps of F Force to the Songkurai camps accompanied by Ian Holding whose father, Wally Holding OAM was a member of the 2/4 Australian Machine Gun Battalion AIF and as a PoW was part of F Force. This intrepid group arrived back in time for the Welcome Reception at Weary Dunlop Park. At 7:00pm we had the Light and Sound show followed by dinner with the Australian and New Zealand Ambassadors and the Quiet Lion Group. Dinner concluded at 10:00pm. Early morning wake-up at 2:30am, bags dropped at the Lobby of HPT and on the bus for Hellfire Pass and the Dawn Service which is due to commence at 5:30am. As the sky starts to lighten in the east, the dawn chorus of the birds starts, a call which breaks the silence in a beautiful way, as if there is more to come. At 5:30am, as the Catafalque Party mounts and the service begins, it is almost light enough to read the service books. Dawn Service in Hellfire Pass is a very moving and emotional Ceremony and everyone who attends finds themselves wiping a tear from heir eye. The haunting sounds of the Last Post and the Rouse echoing off the Cutting walls are something to behold. The lone Piper playing The Flowers of the Forest usually brings even the hardiest undone. This year the Quiet Lion Students had a chance meeting with a group of Thai Military Cadets who were very keen to interact with our group, maybe something may eventuate in the future. A quick Gunfire breakfast at the Hellfire Pass Museum and back to HPT,have breakfast and check bags onto the bus. This morning breakfast is served just inside the front entrance to HPT, as we have to go on to Kanchanaburi for the 11:00am Wreath Laying Ceremony. We say goodbye to the staff who have made us so welcome at Home Phu Toey over the last five days and with promises to be back again in 2018 with a newQuiet Lion Tour. We arrived in Kanchanaburi at 9:45am and time for our Students to have one more drill practice before the main service where they will be presenting the Wreaths to be laid by visiting world dignitaries. It is a moving ceremony among the graves of those who perished on this cursed Railway, with a scrap of humanity and feeling for our fellow man, there really is no need for these graves to be here at all. We had come here to remember them and to honour them that they gave their lives sowe might be able to live in peace and harmony. Neil MacPherson gave a very moving address and received a standing ovation. Thank you Neil. Our Students excelled themselves with the Wreath Laying as usual, a job that has been given to the Quiet Lion Tour. This was formerly done by members of the Thai Military and they would like to do it again. Thanks to our remarkable group of Cadets and Students who participated in The Quiet Lion Tour of 2017. After the Ceremony was completed we adjourned to the Ban Rao Restaurant for a set menu lunch which is a really nice meal. Lunch completed it was time to start to relax as we had achieved what we had set out to do in telling the story of the Thailand- Burma Railway, the hardships and the atrocities and the mateship of fellow POWs. The main object was to get the story of the selfless dedication of the Doctors and the medical staff, quite often with no training and just sheer determination to help the sick often ignoring the danger to their own health by just coming into contact with cholera and amoebic dysentery. Next on the list was the swimming pool at Pung Waan Kanchanaburi Resort, a quiet dinner and retiring for the evening after the shock of a 2:30am wake up. Today we return to Bangkok via Sampran Riverside Resort and Cultural Show. A side trip to Damnoern Saduak Floating Market. We leave from the pier, visit the market and return back to the pier without leaving the long tailed boats. Most enjoyed this style of retail therapy coming back with their market goods. Sampran Riverside, formerly known as The Rose Garden certainly did not disappoint with an enormous range of dishes to delight the palate, there was deserts just waiting to be tried and fresh fruit, surely a gourmand’s paradise. This was followed by the Cultural Show showing traditional Thai village lifestyle and dances. Next stage was the journey to the Royal Benja Hotel, approximately thirty to forty kilometres away. Nothing like a relaxing drive through peak hour Bangkok traffic, after several "are we there yets" we finally crossed the Suphan Taksin Bridge over the Chao Prayo River. With two kilometers to go, it still takes an hour or more to reach our goal. Owing to our group breaking up the following day we hold our final day dinner to wrap the tour up and to thank all that travelled on the Quiet Lion Tour for 2017. A special note of thanks needs to go to Esperance Senior High School and their contingent of Students, Staff and Carers, to Melville Rotary Club and their sponsorship to Melville Senior High School, to Geraldton RSL and local sponsors for their contribution to send Students and Carers, the Three Springs District RSL and sponsors for the Students and Carers, the Peel Health Campus-Mandurah RSL-Holding family group for sponsoring cadets and the Lions Club of Wagin for their sponsorship. Every Student that attended the Quiet Lion Tour of 2017 had local sponsorships and we, the committee and members, thank everyone that helped make the QLT 2017 such a success. A very special thank you must go to the family of Mr Neil MacPherson OAM for the care and attention given to Neil and enabling him to be available to give the PoW Address at the Wreath Laying Ceremony and to be able to relate his time on the Railway as a PoW to the younger members of our group, and a big thanks to Neil for being with us once again. A free day for shopping and rounding up souvenirs and gifts to take to loved ones at home and to see some of the sights of Bangkok. The Students were looked after by their supervisors and had a successful day. Sydney travellers had to leave at 3:30pm for the airport and Melbourne and Brisbane travellers left at 8:00pm, which only left those going to Perth leaving at 4:30am the next morning. Another successful tour completed and now we plan for 2018. AWARD OF MEMBER OF THE ORDER OF AUSTRALIA (OAM) TO EX-POW, THE LATE GORDON MAITLAND ROBERTS. In the Queen’s Birthday Honors announced on June 13 2016, Gordon Maitland Roberts, a member of the 2/3rd Machine Gun Battalion in World War 11 and captive of the Japanese on the Burma Thailand Railway, was appointed as a member of the Order of Australia (OAM). 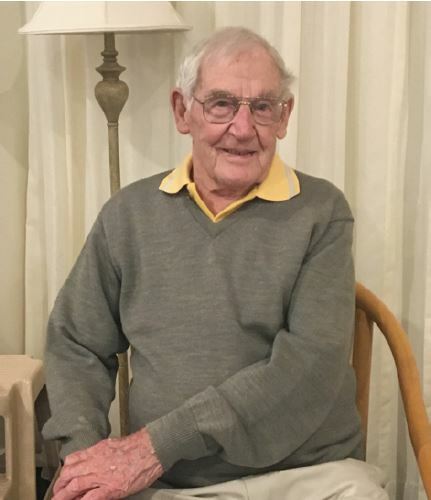 Gordon was born at Moora, Western Australia to a farming family on March 3, 1919 and was a “jack of all trades” working in rural areas of Western Australia prior to World War Two. He was one of a group of seventeen country boys from the town of Moora in WA who were members of the Militia in the 10th Light Horse and enlisted in the AIF on January 21, 1940, joining the all-Western Australian 2/3rd Machine Gun Battalion. The Battalion sailed from Fremantle in a convoy including the Queen Mary, Queen Elizabeth 11, Aquitania, Mauritania, Isle de France and the Andes. The convoy called at Colombo and the battalion disembarked at Port Tewfik on the Suez Canal and later trained at Palestine and in Tel Aviv. The battalion saw action in Syria and later at Mrouj, near Beirut in Lebanon. Gordon Roberts was considered a leader of men and was promoted to Lance Corporal. In February 1942 the battalion travelled on the Orcades via Durban, South Africa, to Oosthaven in South Sumatra. They disembarked at Batavia (Jakarta) before travelling by road to Bandoeng. On 9th March 1942 the Dutch surrendered (including the Australians). After nearly a year in Bandoeng the battalion went to Makasura before being shipped to Singapore with Dunlop Force under Lt Colonel Sir Edward Dunlop. In January 1943 Dunlop Force went by train on a five day journey in cramped steel rice wagons from Singapore to Non Pladuk in Thailand and then to the Konyu River Camp, the Hintok River Camp and the Hintok Road Camp. 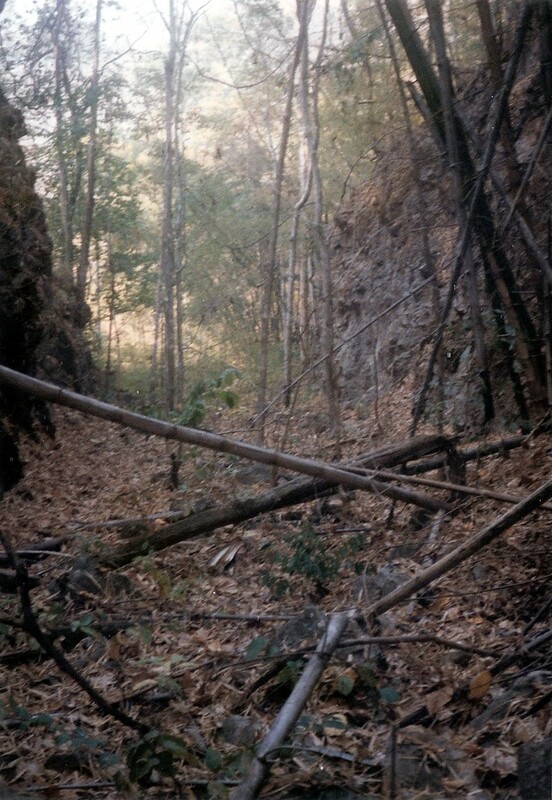 Dunlop Force worked on the section of the Burma Thailand Railway between Konyu (Hellfire Pass) and Compressor Cuttings. Members of Dunlop Force suffered similarly to all prisoners on the Burma Thailand Railway with diseases, inhumane and brutal treatment, starvation, overwork, lack of basic needs and terrible conditions. At the completion of the railway Gordon Roberts went with his group to Tamuang in Thailand, followed by movements to various other areas on maintenance work and he remained in Thailand until the Victory in the Pacific. When it was decided in 2002 to form the Burma Thailand Railway Memorial Association, dedicated to ensure that the story of the “Railway” would not be forgotten, Gordon became an active supporter. The Association arranges an annual pilgrimage to Thailand for Anzac Day, the Quiet Lion Tour, which is named for Sir Edward (Weary) Dunlop. A feature of the tours is that a large group of High School children and service cadets are taken to Thailand. During his war service and following his discharge from the Australian Army on January 31, 1946, Gordon Roberts was renowned for his “mateship”, resourcefulness and his compassion for his fellow prisoners. During captivity he spent countless hours foraging for little extras for his mates who were ill, on light rations and unpaid. He would stay with men in their dying hours maintaining the tradition of “nobody must die alone”. Even when the dreaded cholera epidemic raged he still nursed cholera patients without any regard for his own health. He was a very robust man, raised in the country, and withstood the ravages of the prisoner of war experience to the point he often stood in for his mates who were too sick to work. A very notable aspect of the resourcefulness shown by Gordon Roberts was his ability to scrounge, barter and acquire by any dubious means food and medicine to help his mates. This ability may not be recognized generally but in the circumstances prevailing on the Burma Thailand Railway it was most important. One illustration of this is provided in the authenticated story involving close friend and POW “Snow Fairclough. “Snow” made his way most nights from the Hintok River prison camp to the nearby Kwai Noi River to set improvised fishing lines and on one occasion snared a large fish. He took it to Gordon Roberts with a view to them sharing the extra rations with his mates. Gordon instead went to the adjacent English officer’s camp where he was able to sell the fish to an English officer and received what was regarded as a fortune. He in turn used the proceeds to acquire salt and fresh vegetables from Thai villagers and various medicines from Thai River Traders. An interesting sidelight is that the English Officer was a Major named Swanton who transpired to be E.W. Swanton, the noted English cricket commentator. “Snow” Fairclough met Swanton post-war during a Test Match in Perth and Swanton recalled the exchange, adding that he got the fish for a “song” and out-bargained the Aussie POW. After discharge on January 31, 1946 Gordon Roberts immediately returned to farming and agriculture and with many years of hard work and good business practice he created a thriving business breeding cattle and sheep. It is of particular note that with Gordon Roberts’ passing, his friend Milton “Snow” Fairclough is the only remaining man of the seventeen from Moora who enlisted together and were all captured by the Japanese. Gordon Roberts was deemed eminently suitable for recognition by the Australian Honors and Award system due to his Military service, his service to the ex Prisoner of War movement, his success in business, his community service and his encouragement and mentoring of youth. Gordon’s medal is awarded posthumously. PRESTIGIOUS AWARD TO COMMITTEE MEMBER OF THE BTRMA.